The Eppendorf 5702R Refrigerated Centrifuge is designed for separating mixtures with different densities. The 5702R comes from a long line of reliable tools from Eppendorf and focuses on in-vitro diagnostic applications where samples are extracted from the human body and an analyzed. The Eppendorf 5702R Refrigerated Centrifuge comes equipped with a couple of key features including a fast cool function for pre-cooling, built-in condensation drain to eliminate water accumulation preventing corrosion and an ECO friendly shut down feature after eight hours of non-use. In addition, the compact design and quiet whisper motor makes the Eppendorf 5702R a must have for every clinical and cell culture laboratory. This refrigerated centrifuge also has a temperature range of -9 to +40 °C. Readouts on this microprocessor controlled benchtop centrifuge are all shown on the easy to read LCD screen, and give users access to user defined programs, up to two. In fact, the Eppendorf 5702R has been an industry standard in some of the biggest clinical trials, over the past five years. The Eppendorf 5702R Refrigerated Centrifuge has a sleek design and whisper quiet operation, making centrifuge ideal for almost any lab environment. With 6 different rotors for end users to choose from this versatile centrifuge can be adapted to fit a wide variety of applications including cell culture and clinical studies. The Eppendorf 5702R Refrigerated Centrifuge has a wide selection of interchangeable rotors to choose from including fixed angle and four place swinging bucket models. The centrifuge’s low access height allows for easy loading and unloading. No more standing on lab stools to load your samples. Eppendorf has traditionally made a product line of reliable centrifuges and the 5702R is no exception. The sleek design and easy to use push button controls, makes it a must have on any researchers list. These easy to use Refrigerated Centrifuge systems come with rapid cooling, protecting those temperature sensitive samples. This centrifuge includes a F-35-30-17 Fixed angle rotor with 15ml adapters and is new in the box. Contact us today to learn more about our Eppendorf 5702R Refrigerated Centrifuge. 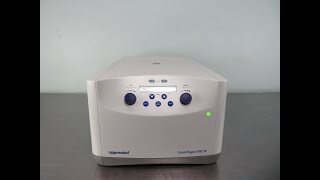 This Eppendorf 5702R Refrigerated Centrifuge is brand new in it's box and has been tested for functionality. All of our lab equipment comes backed with our standard warranty. Should you have any questions please don't hesitate to contact us.